I have now been walking Boris (the vizsla in the photo) for over a year. In that time he has gone from being the cutest puppy, to a wee bit of a tearaway to the more grown up gorgeous boy he is now. He has one of the biggest personalities of all the dogs, gets on famously with everyone, adores our walks together and is so excited when I go to pick him up that he is hard to contain! I laugh out loud at Boris and his antics often and although he can be a tiny bit dominant within my pack, it’s hysterical if I bump into another dog walker with their pack. Most of my pack will go up to the other pack, tails wagging and curious – but where is Boris? Always, always right between my legs HIDING from them – he practically knocks me over in his haste to get to me. Not so brave then, eh Boris? 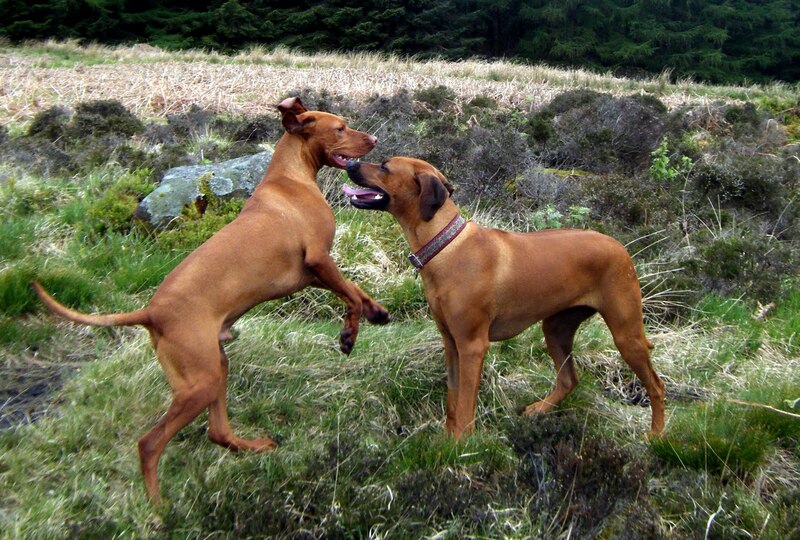 He is pictured here with a dog that he gets on brilliantly with, Rio the Rhodesian Ridgeback.